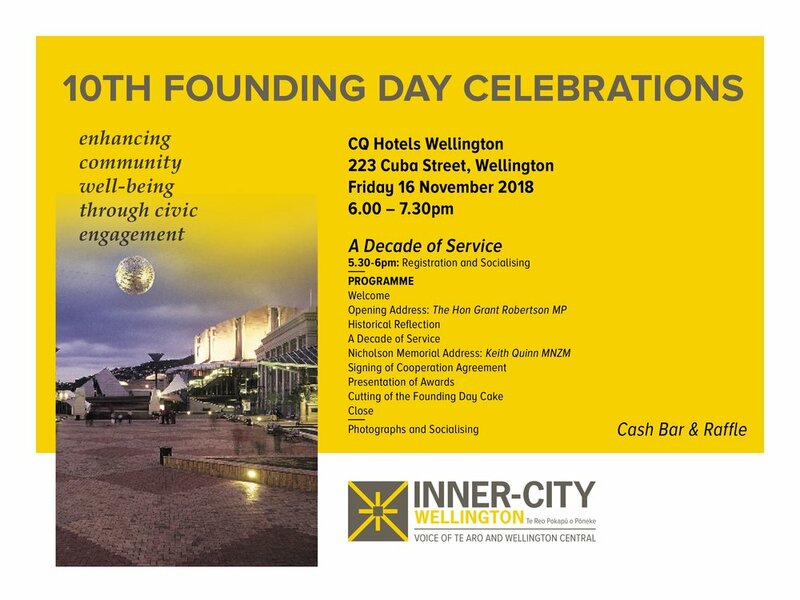 Join Inner-City Wellington for a celebration of the tenth anniversary of our founding, and a look towards the future of our city. The Opening Address will be given by The Hon Grant Robertson MP and the Nicholson Memorial Address will be on “Life in Wellington” by Keith Quinn. Born in Te Kuiti, King Country, New Zealand but mostly raised in Wellington where he has lived most of his life, Keith Quinn will give us an insight into life in Wellington. Keith, a legendary sports broadcaster, has come to be known as the voice of All Black test rugby in New Zealand. He has worked on countless All Black tours and covered every Rugby World Cup since they began. Quinn worked for the NZBC/TVNZ for four decades, as both presenter and commentator. Aside from rugby, he has covered seven Olympic Games, ten Commonwealth Games, and three Paralympics. Keith has always been in demand as an entertainment or motivational speaker. At various times he has been an after dinner or luncheon guest speaker at functions in; New Zealand, Australia, Fiji, Papua New Guinea, South Africa, Hong Kong, England, Scotland and Ireland. He was guest speaker, along with the World Formula One Motor Racing champion Sir Jackie Stewart, at the Halberg Awards Dinner in Christchurch in 1988. Entry is free, but we kindly request that you RSVP via Facebook or Eventbrite for catering purposes.